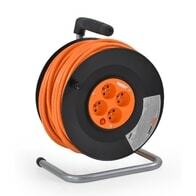 Extension electric cable, length 20 m, cable type: 3 x 1,5 mm. Supplied in a transparent orange color, to be clearly visible in the grass etc., to reduce risk of hazardous cable damage. 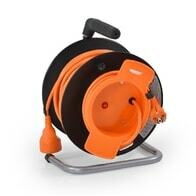 Extension cord reel 25 m / 4x socket. Conductor cross-section 3 x 1.5 mm. 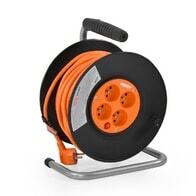 Extension electric cable, length 30 m, cable type: 3 x 1,5 mm. 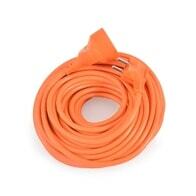 Supplied in a transparent orange color, to be clearly visible in the grass etc., to reduce risk of hazardous cable damage. Maximum power load of straight cable is 16A. Maximum power load of tangled cable is due to cable induction reduced to 5A! 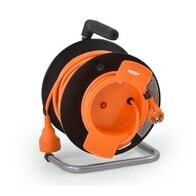 Extension cord reel 50 m. Conductor cross-section 3 x 1.5 mm.